Next generation wireless is not about technology, it is all about marketing…. What is the service offering rather than the features of the latest handset? Who are the customers and which are the most profitable? How do you identify and market to communities? How do you tariff for profit? If you need to know the answers and more, you really need to read this book. In the 1990s mobile operators underutilized marketing and only focused on rapid expansion of capacity and connecting new subscribers. Today, with the mobile services industry more mature and competitive, the authors unveil how more modern marketing is needed for success both in market share and profitability. 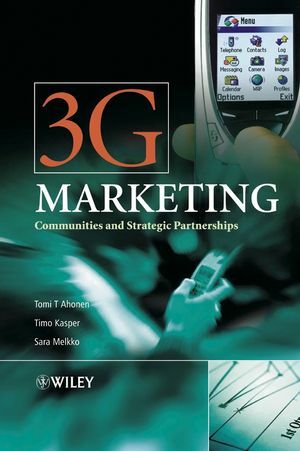 3G Marketing explains the role of early adopters, communities, reachability, brands, portals, and handsets to 3G success. It shows how success in 3G is dependent on successfully building strategic partnerships by covering issues from market intelligence to sales channel support. Aimed at the non-technical person, this authoritative resource gives clear and practical advice on how to use modern marketing methods to promote and sell mobile services. It provides a perfect and invaluable introduction for anybody entering mobile telecoms or companies faced with the need to partner with operators as crucially, it explains how services and applications can be brought to the market in the fiercely competitive 3G marketplace. Tomi T. Ahonen is an Independent 3G Consultant based in London. He has presented at 100 conferences in six continents and lectures at Oxford University’s 3G courses. He previously headed Nokia’s 3G Business Consultancy Department and oversaw Nokia’s 3G Research Centre. He also worked as Nokia’s Segmentation Manager. Earlier he worked for Elisa and Finnet International in Finland and OCSNY in the USA. Tomi’s accomplishments include the world’s first fixed-mobile service bundle, the world record for taking market share from the incumbent, and a multi-operator billing system. He started his career on Wall Street. Tom holds an MBA from St. John’s University NY, and a Bachelors in Marketing from Clarion University. His previous books are m-Profits and Services for UMTS. Timo Kasper is the Director, Finance, Administration and ICT (CFO) of Observer Finland, a company specializing in Competitive Intelligence and Business Environment Scanning services. Timo has been responsible for constructing winning strategies for the emerging competitive markets in Finland and deployed innovative IT and telecoms solutions. Earlier he worked as the Business Controller for Computer 2000 (aka TechData), Finland’s largest IT wholesaler, and started his career as an Auditor and Consultant at Arthur Andersen & Co. where he participated in a wide range of attest service assignments, mergers and acquisitions, legal and financial due diligence and business process re-engineering projects. Timo holds a B.Sc. (econ.) degree from the Helsinki School of Economics and Business Administration and lives with his family in Espoo Finland. Sara Melkko is an Independent Expert in the field of telecommunications and the Internet, having worked in Finland and Germany as Marketing and Brand Manager with the digitally converging solutions provided by Elisa Communications across fixed, mobile and broadband telecoms, and then with pioneering mobile Internet innovations with Jippii Group. Sara then worked with IT security matters with SECUDE GmbH. Sara has a multicultural and –lingual background and holds a Business Administration degree from the University of Passau in Germany and has completed the “European Master’s Degree in Human Rights and Democratisation” programme in Venice and Padua, Italy. Sara currently focuses on Human Rights Business perspectives within Corporate Social Responsibility. She currently maintains home bases in Frankfurt and Helsinki.